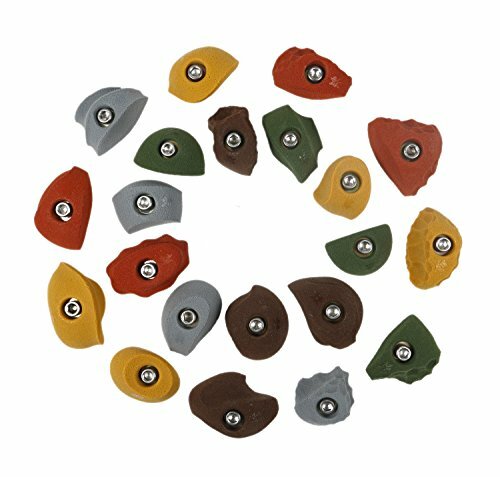 This 21 classic set of rock climbing holds are great foot holds that can be used as beginner level feet or small intermediate hand holds. They are excellent for any gym or home rock climbing walls, and can be used for varying difficulties of routes, depending on terrain and orientation of the hold. These classic foot holds are especially great for kids and beginners trying to work on their strength, balance, endurance, and climbing confidence. They bolt on securely to enhance your safety and give you peace of mind while training. Great for the experienced and intermediate climbers alike, providing many challenging shapes to improve hand and footwork. This set consists of 21 strong and stable small bolt-on holds along with all the necessary hardware. Stands off wall 1 - 1 1/4"
This pack of 21 classic foot holds are among our best sellers, and for good reason. Not completely satisfied? All of our products have our 30-day return policy. Experience your new climbing holds risk-free. Order now to start building your realistic wall and improving your climbing technique. EASY TO USE - Atomik's premium quality climbing holds are extremely easy to install and use. Perfect for any home or gym climbing wall. Great for indoor and outdoor technical training. All hardware is included. CHALLENGING AND FUN - Comes with 21 premium quality small hand / foot holds. Can be used for varying difficulties of climbing routes, depending on terrain and orientation of the hold. TENNIS SHOE FRIENDLY - Excellent for backyard or basement walls for intermediate rock climbers. Also great for slightly steep terrains. PREMIUM QUALITY - Unbreakable polyurethane with a limited lifetime warranty. You will be able to enjoy these climbing holds for years to come. Includes 21 small and unique climbing holds in a variety of colors. Choose from bright or earth tones. GUARANTEE - All of our products come with our 30-day return policy money back guarantee.